I keep this recipe up even though this site has transformed into a place dedicated to the low-carb, high-fat lifestyle because so many people are still searching for, finding, and loving this recipe. It's truly a wonderful recipe; and still part of my once a year holiday tradition. Feel free to experiment using natural low-carb/keto-approved sweeteners. I hope you enjoy these cookies as much as I have my entire life! I was blessed to have my grandmother, Helen in my life until just a few years ago. Her parents immigrated to the United States from Hungary, and I suppose she learned this recipe from her Mom. I'm so thankful that she showed me exactly how to make these Hungarian cookies and that I wrote down the recipe. 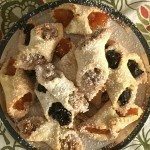 Her Hungarian Cookies are made with sour cream, not cream cheese, as is used in most Kiffles recipes, so it turns out an even more delicate and light pastry dough than most. She never called these Kiffles though, they were always just called Hungarian Cookies in our family. After you've taken the time to make these, I think you'll agree that these are the best Hungarian cookies you'll ever eat. There is nothing like eating a few for breakfast with a steaming cup of coffee on Christmas morning surrounded by your family and the glowing Christmas Tree. To Helen. 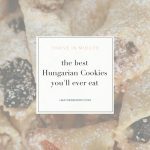 Who made the best Hungarian cookies with love. TIP: Make up the three fillings the day prior to baking. 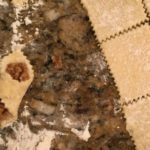 Just refrigerate them covered overnight, then allow to come to room temperature before making up the dough & rolling it out. Also, you'll need to get yourself a pastry cutter wheel to cut out the dough with a pretty fluted edge. Enjoy! Servings: 5 -6 dozen depending on how big you cut them out. 4 &1/2 C King Arthur unbleached flour preferably organic, plus more for flouring hands and counter. Walnut Filling: Heat together chopped walnuts, milk, and sugar in a saucepan over medium heat until the sugar is melted. About 5 minutes. Remove from heat. Place into a covered container and set aside until ready to fill cookies. Prune filling: Place prunes in a saucepan. Fill the saucepan with just enough water to cover the prunes. Simmer on medium heat until prunes are tender, about 15-20 minutes. Drain prunes. Transfer to a bowl, add cinnamon and mash well with a fork. Place into a covered container and set aside until ready to fill cookies. Apricot Filling: Place apricots in a saucepan. Fill the saucepan with enough water to just cover the apricots. Simmer over medium-high heat, covered, until apricots are tender and most of the water has been absorbed; about 20-25 minutes. Drain apricots. Add sugar to the pan and mash well with a potato masher. Alternately, you can also use an immersion blender or blend them up in a food processor. Place into a covered container and set aside until ready to fill cookies. In a separate bowl, add dry ingredients, mixing to combine. Add dry ingredients to the butter & sugar, a cupful at a time, mixing on medium speed, until combined. Whisk together eggs, vanilla, and sour cream in a large separate bowl, then add the dry mixture. Work dough together gently with a spatula until mixed. The dough will be sticky. Liberally flour a clean work surface. Flour your hands and sprinkle flour over dough. Place dough on your floured work surface and divide into thirds. 8. 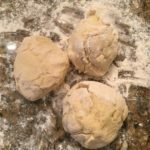 Roll out the dough ball into a squarish shape using a floured rolling pin with light forward strokes (do not push down with your pin) until the dough is ¼" thick. Keep flouring your rolling pin &/or dust the top of the dough with flour if the dough is sticking to the rolling pin. 9. Place some flour in a shallow bowl, and fill another shallow small bowl with water. 10. Dipping the pastry cutting wheel into the flour at each pass, cut the dough into 2½" squares. Remove misshapen ends. You can re-roll these out to use as much of the dough as possible. 11. Loosen each square from your work surface before filling it by dipping your spatula into the flour bowl, then use it loosen a square from the work surface. 12. 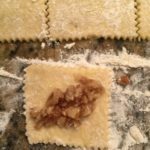 Place a teaspoon of walnut filling across the center of each square. 13. Gently fold the dough over the topping on the diagonal. Moisten your fingertip with water from the water bowl, then wet the tip of the folded corner. 14. Gently fold over the other side pressing lightly onto the wet dough. The wet tip will seal the edges together and prevent edge separation during cooking. 15. Gently shape into a crescent shape (if desired) and place onto an ungreased cookie sheet. Repeat until your dough is used up. 16. Bake about 25-30 minutes on a rack in the middle of the oven. 17. 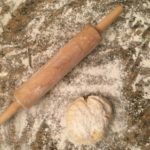 Repeat this process for the remaining two dough balls, filling each with the prune and apricot fillings, but do the nuts first, since the oven can get hotter later in cooking and can overcook the nuts. 18. Cookies are done when the bottoms are light brown and the edges of the top are just starting to brown. 19. Shake powdered sugar on top just before serving. You will have extra prune & apricot filling left over. These are great for morning toast. Better to have extra filling than to run out during baking. 🙂 Recipe doubles nicely for making up a large batch over the holidays. Cookies will keep at room temperature for up to five days. These cookies freeze well, just cover the cookies in a plastic container and then wrap the outside well with plastic wrap. To thaw, remove plastic wrap and allow to come to room temperature - about two hours. Hi, Melissa. The dough will dry out. I’d make it the same day you bake the cookies. Always keep a damp towel over the dough even while you are cutting & filling the cookies! Can I make this dough the night before or will it dry out in refrigerator? I have misplaced my gramma’s Hungarian cookie recipe and decided to look online for one. Yours seems to be just like hers so I was so glad to find it! Even the same fillings! I am going to make them for Christmas and sit back and remember my gramma with every bite! 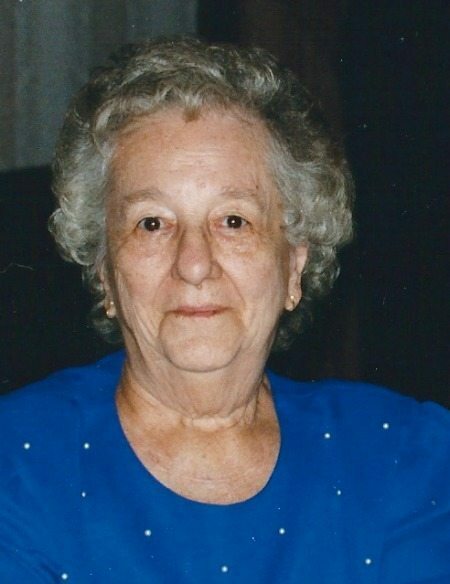 My gramma passed in 1996. She came from Hungry with her family and her name is Helen too. Helen D. Janus. Also, she lived in Walllingford, CT for most of her life. One town over from your gramma. Talk about coincidence! You’ll cream together butter and sugar with a mixer first. Add dry ingredients to the butter & sugar, a cupful at a time, mixing on medium speed, until combined. This is your new dry mixture. Then you’ll whisk together the eggs, vanilla, and sour cream in a large separate bowl, then add the new dry mixture to that. I’ve never used parchment paper to bake these cookies. It isn’t necessary, they will not stick. I have two questions please. Does the egg, sour cream and vanilla mixture get added to the flour mixture or vice versa? Do use parchment paper on the baking sheet? Heather , my family has been making these cookies for over 30 years from a recipe my sister got from a sweet Hungarian woman. As you said , true Hungarian dough for these does not contain cream cheese. But after being incredibly lucky to see your recipe , I used yours. They are FABULOUS! I mean , incredible. Ours were good , but , these way surpass them. 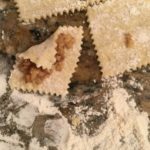 I cannot thank you enough for taking your time , and being so generous , to share this wonderful recipe. On my recipe card , I gave your sweet grandmother Helen , and you , total credit. Thank you Heather! You are wonderful to share this. I hope your gramma knows how much we all appreciate this! Keep up your great site! Big Hug. Ok – for sure! I’d love to. Just let me know when you’re available to give me the tutorial on these cookies, Heather! Have camera — will shoot! did your mom ever live in mansfield, ct because i had a great aunt helen, who was from mansfield and i was wondering if this was her? I’m so glad you enjoyed them Kathy! Just finished making these…yum. 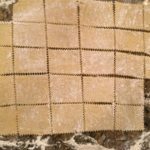 My husband’s grandmother was Hungarian and always made these. This dough was so easy to work with. Great reciipe!